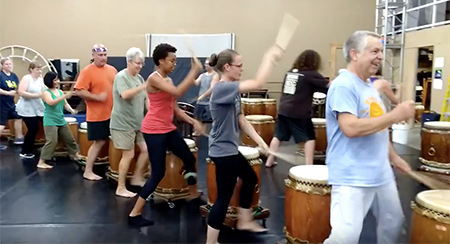 Our intermediate taiko classes and workshops are listed below. Our Community Group is for players who wish to work together as a group to increase skill levels, expand repertoire, and work towards community performances 3–5 times a year. AART students may ask to join the Community Group after 3-6 AART sessions. Performer Understudy Practices are for Community Group members who want to challenge themselves. Any CG member may stay for the Saturday PUP and/or ask if they may attend the Wednesday PUP.